Trembling Earth celebrate the release of their second studio album with special guests Daniel Hutchens (from Bloodkin) and Steven Glude. Trembling Earth is a rock 'n' roll and blues band currently based out of Southeast Michigan. 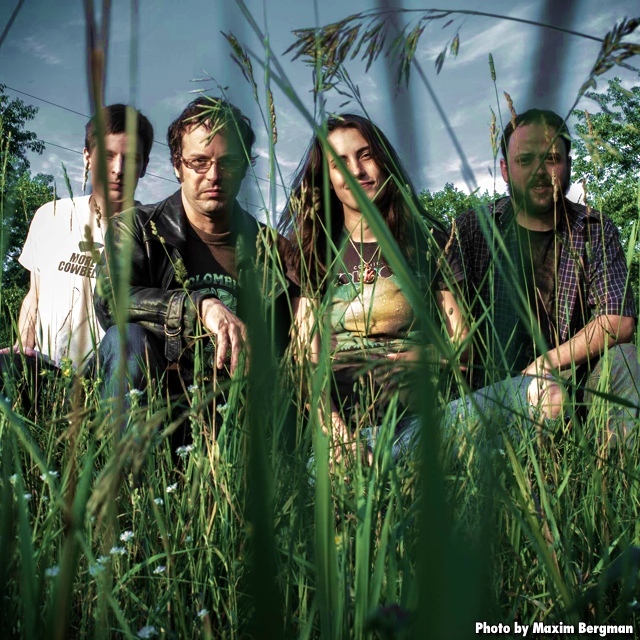 Trembling Earth is known for wild live performances, mixing classic blues and rock, psychedelic jams, and imaginative songwriting and arrangements setting the band apart as a true original act. This band gets the crowd up and dancing! The band just celebrated the release of a new EP at The Blind Pig in Ann Arbor, MI. In 2014 look forward to a full length album backed up by a short tour down South and the hitting the Mid-west summer music fests. Founded in Athens, Georgia in 2000 by singer/songwriter and Waycross, GA native, John Heath, who chose the name in homage to Native Americans from Okefenokee, which translates to Land of Trembling Earth. Relocating to Ypsilanti in 2005, John soon began working with various musicians including drummer Timmy Slats and Michael Lipson. Successfully building draw and landing gigs around Southeast Michigan, and Ohio, John Heath once again relocated to Chicago. Trembling Earth recorded its first studio album (Creatures) in ten hours in 2010, and toured for the first time back down South with a live album (Live at Lunar 2009) to boot. Look forward to great things to come from this band Trembling Earth as a regional act in the Midwest, and as things progress and we work harder and harder to invest our time, money, and talent, the next great American Rock Phenomenon. Daniel Hutchens and Eric Carter met each other when they were eight years old. They solidified their early friendship based on a mutual love of baseball, comic books, and rock n roll music. They grew up in West Virginia; much time during their high school years was spent on Skull Run Road, where Eric's family lived, a few miles outside Ravenswood. The boys recall that road as being the site of their first garage band practices. After high school, they started getting a little more serious about their blossoming songwriting partnership. Their road wound through Huntington, WV, and eventually on to Athens, GA, which they soon came to call home. They continued to concentrate on their songwriting, and by the early ‘90s they had a catalogue of over 300 compositions. By this time Hutchens and Carter had given their musical collaboration a "band name": Bloodkin. People started to notice, and some even started covering some Bloodkin compositions, most notably Widespread Panic, who wound up recording three Bloodkin songs, and who continue to play those and other Bloodkin songs live. Panic's cover of "Can't Get High" peaked at #27 on the Billboard AOR charts. Other songs in Panic's regular rotation are "Makes Sense To Me", "Henry Parsons Died", "End Of The Show", "Who Do You Belong To", and occasionally "Quarter Tank Of Gasoline". Daniel also wound up playing with ex-Velvet Underground member Moe Tucker in the early-to-mid ‘90s; he played on three of her albums and several of her tours. In 1994 Bloodkin released their first official CD, GOOD LUCK CHARM. The project was produced by Johnny Sandlin (legendary producer of the Allman Brothers, Eddie Hinton, and so many others). Bloodkin recording projects over the years have also featured producers John Keane (R.E.M, Cowboy Junkies, etc.) and David Barbe (Son Volt, Drive By Truckers, etc.). All the while, the Bloodkin boys have continued to play live all over the Southeast and beyond. Daniel and Eric have shared the stage with different lineups throughout Bloodkin's history, but the last several years have cemented a familiar band: Daniel on vocal and guitar, Eric on guitar and backing vocal, William Tonks on guitar, dobro and backing vocal, Jon Mills on bass, and Aaron Phillips on drums. Recording sessions for the next Bloodkin project will begin in the summer of 2014.